As a leading provider of HVAC services in and around Santa Clarita, the Antelope Valley, the San Fernando Valley, and Ventura County for over 30 years, the qualified and caring professionals at Rowland Air understand the importance of meeting customer needs. Our customers are our top priority, and we strive to go the extra mile to ensure positive interactions and outcomes at every turn. 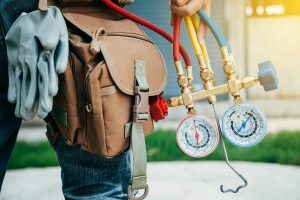 Whether you’re installing a new heating system or new air conditioner, setting up a regular schedule for maintenance, or looking for modern upgrades like smart home thermostats or zoning systems, the experienced technicians at Rowland Air will deliver the expert advice and superior service you expect and deserve. Customers will especially appreciate our 24/7 emergency service, which ensures that you never have to wait long to restore heating or air conditioning that has malfunctioned. With proper installation and maintenance, your HVAC components will perform admirably for many years, but eventually, parts wear out and need replacement. When this happens, you need to know that you can quickly and easily schedule an emergency visit from an expert technician to address the problem and get your heating or cooling back up and running. Whether your air conditioning goes out during a heat wave, turning your home into a virtual sweatbox, or you lose your heat during the colder winter months, you can call Rowland Air and speak to a real person round-the-clock. Our dedicated staff is generally available to take your calls from 6 am until 9-10 pm each night, while our after-hours answering service ensures that you’re always able to reach someone. After-hours calls will be returned the following morning, so we can schedule a speedy appointment to address your emergency needs. In most cases, we’re able to get a technician to your location within 24 hours of receiving your call, even after-hours, on weekends, and on holidays. We know how difficult it can be to cope with extreme temperatures in your home when the HVAC is malfunctioning, which is why we offer round-the-clock emergency service to restore comfort and add convenience. There’s nothing worse than learning you have to wait days or weeks for a service call when your AC goes down in a heat wave or your heating fails in the middle of winter. At Rowland Air, you’ll get the immediate attention and swift resolution you need to get on with your life. For 24/7 emergency air conditioning service or furnace repair services, contact us online or call 800-500-9068.